We all know the contrarian mantra - "buy low and sell high." But we've also experienced the low go lower and the high go higher - and that hurts. So at MarketPsych we decided to figure out whish stocks are likely to reverse, and which aren't. 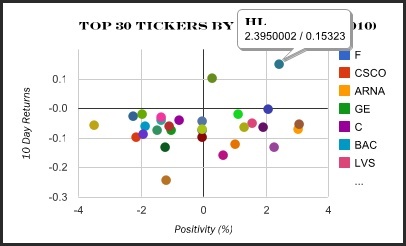 It turns out that spikes in sentiment must be correlated with the price action for a reversal to be immminent. We discovered this phenomenon 5 or 6 years ago, and over the past two years we've been trading these reversals at MarketPsy Long-Short Fund with positive results (DISCLAIMER: this is not a solicitation). Now we've started offering a tool to help others identify contrarian set-ups that are likely to be profitable on our beta website (location to be divulged in 2 weeks). You can see some interestign setups this morning, pre-market, that were already extremely profitable by the close of the first day. 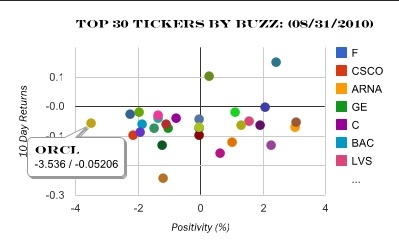 The chart depicts relative sentiment (called "Positivity") in social media conversations plotted against the past ten days' price change. As you can see in the chart, HL was the most overbought stock this morning. By the end of today the stock was down (-0.35%). "So what about oversold stocks?" you ask. Excellent question. The two most oversold stocks happened to be in the technology sector. Their charts are depicted below. 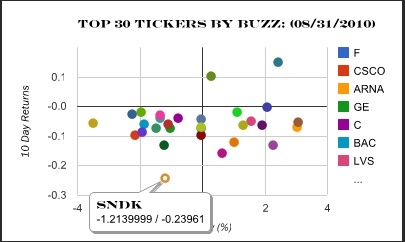 Both of them are up today, with ORCL up (+3.7%) and SNDK up (+5.0%). As you can guess, these are likely to be short term price moves, and sentiment reversals tend to be short-term phenomena (as documented in many academic papers). Nonetheless, it's interesting to see such a clear example today.